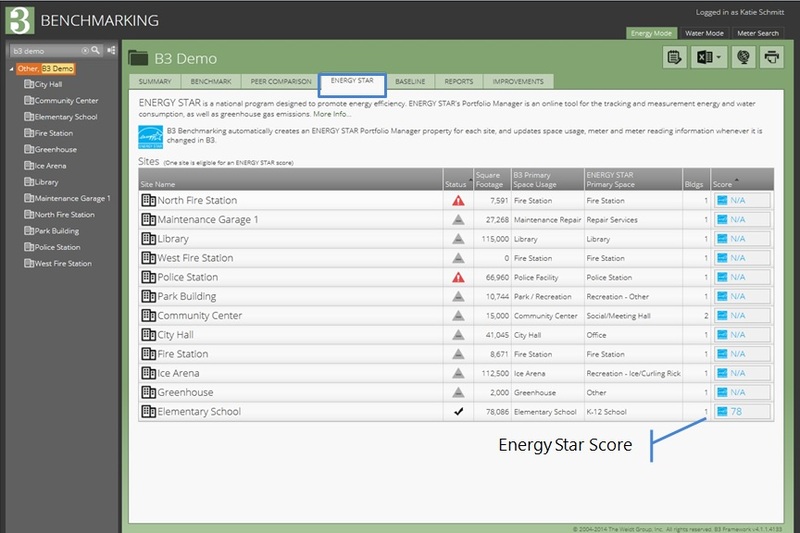 You can manage and view energy and water data on two basic levels in B3 Benchmarking - the Organization and Site levels. An organization such as a city or company can consist of one or more sites. Each site includes one or more buildings that share at least one meter, because when meters are shared, individual building energy consumption cannot be disaggregated. When a building does not share any meters, it can stand alone on its own site. The tree on the left side of the application helps you navigate between the two levels and across sites. To switch between energy and water views, click the Energy or Water Mode tabs in the top right of the application. Both the Energy and Water Mode consist of multiple analysis and reporting tabs. Each of these includes a basic description at the top of the page, and when you require help in understanding the page, click "More Info" to bring up a help screen. Knowing which building sites use more energy than expected identifies which buildings are cost-effective candidates for energy retro-commissioning or retrofit projects. And knowing which buildings are consuming more or less energy than in previous years allows you to know which buildings to focus attention on right away so you can determine what is required to maintain or improve its energy consumption. Organization Level: The summary view displays high-level organizational information and completeness. Missing data for the organization is summarized in the top left corner. The first example shows this organization has 1 site, 1 building, and 2 meters that are incomplete. Incomplete sites will be designated with a red warning triangle in the status column of the lower panel. The lower panel also summarizes the contiguousness and recentness of the meter data. Edit an organization by clicking the notepad icon in the top right of the application. Site Level: On the summary tab you will find a summary of the site's performance based on the four metrics in B3 Benchmarking as well as the list of buildings and meters located in the site. 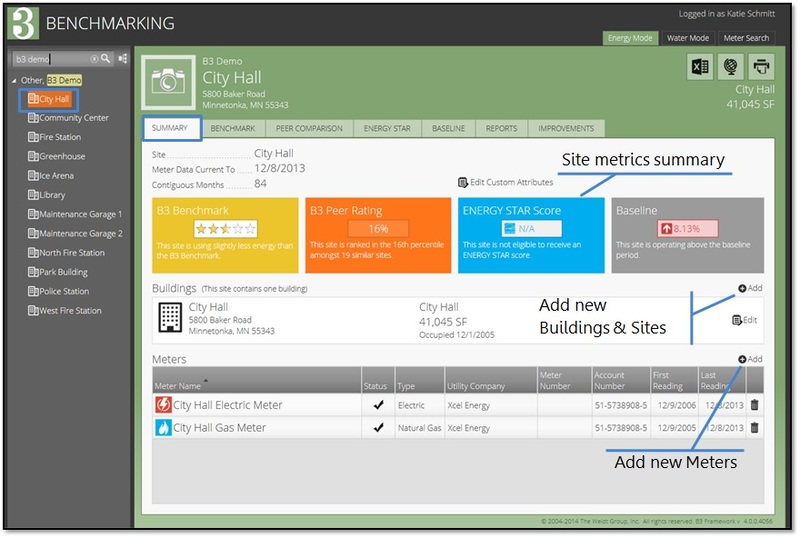 You can also add and edit buildings and meters on this tab. To edit information about a site, click the notepad icon at the top right of the screen. The Benchmark view uses an engineering model of your building, created from the data you enter, to predict its energy consumption as if it were built to the current energy code. Of course, the more accurate your building data is, the more accurate the model will be. This modeled energy consumption, the Benchmark, is compared to the Actual energy consumption in the form of the Index Ratio. Those buildings with higher ratios will yield the highest return on investment of funds spent on energy performance improvements. The top panel shows the organization's energy consumption by fuel source as compared to the Benchmark total. In this example, the completed sites for the organization are using 51.34 kBtu/SF for electricity and 50.14 kBtu/SF for natural gas. Dividing Actual energy consumption by the organization’s composite benchmark consumption of 102.29 kBtu/SF for completed sites, the result is an Index Ratio of 0.99 - meaning that the actual energy consumption for the organization's buildings are performing close to the energy-code-based models. The lower panel displays a list of the organization’s sites sorted by the Benchmark Index Ratio in order to draw attention to the most important sites. Sites at the top of the list either have errors in data, which can be addressed in the Building and Meter Editors, or they are likely using more energy than they should. Those sites in the latter category are great candidates for energy assessments. In the example, the first site in the list eligible for a Benchmark Index Ratio shows an Actual total of 141.31 kBtu/SF and a Benchmark total of 123.17 kBtu/SF, which results in a ratio of 1.15. 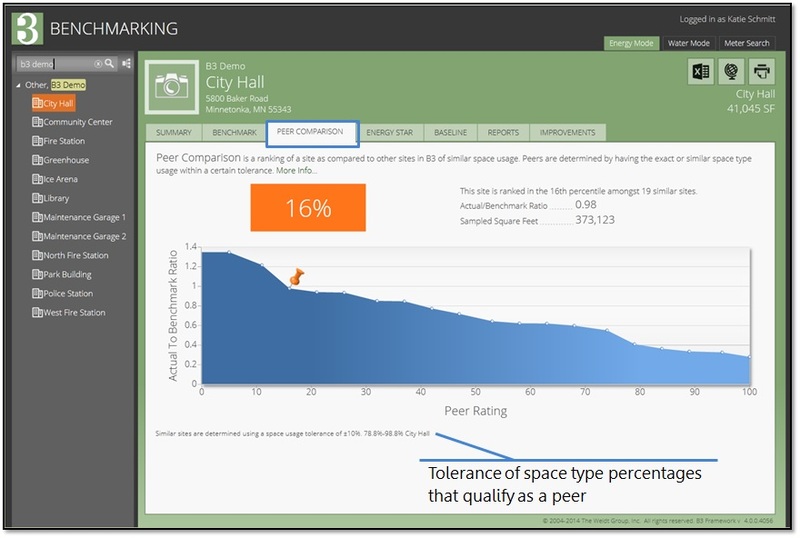 Benchmarking by fuel type is also available, which shows you the expected energy use for each fuel type utilized by the building and helps inform your decisions on potential improvement projects. For example, if your building is using more electricity than expected by the benchmark model, you may want to investigate a lighting retrofit or reducing plug loads. Click the drop down menu to view expected energy use by fuel type. The Peer Comparison view allows you to see how your sites compare to other sites within B3 Benchmarking of similar space usages. Peer sites are determined by having the same space type usage or similar space type usage within a certain tolerance, as noted at the bottom of the screen. If there are not enough similar sites, a peer comparison rating is not available. To compare sites of similar space type, B3 uses the Benchmark Index Ratio - which gives the you an idea how buildings are performing relative to an expected model. At a Site level, a graph is provided as a visual representation of the percentile ranking. This basic graph can be very helpful in informing you that buildings have much potential for improvement based on the fact that similar buildings in the same region are using less energy. The ENERGY STAR tab allows you to compare and understand whether your buildings are consuming more or less energy than similar buildings nationwide by obtaining an ENERGY STAR rating for eligible sites. If a site is eligible, the ENERGY STAR rating will appear here. A red triangle in the status column indicates there are errors in the data; whereas if the sites is ineligible for a rating, a grey triangle appears. The most common reason for ineligibility is that a site contains more than 25% 'other' ENERGY STAR space usage. In the example, the Elementary School received a rating of 78 while their other sites are ineligible. The Baseline view allows you to stack rank your portfolio of sites to show which buildings are currently using more or less energy compared to a previous Baseline year. 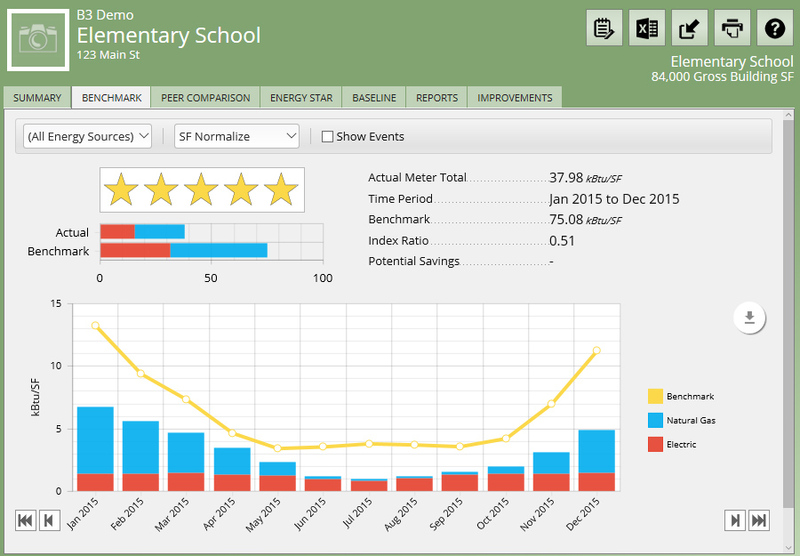 Baselines are used to track savings from improvement projects and manage the site’s energy performance on an on-going basis. This example has a Baseline year of January 2010 to December 2010. This can be changed by clicking the calendar icon and selecting a new 12-month period. Selecting a Baseline year at the organization level establishes the “Baseline” performance for each site within the organization. To change a Baseline for a specific site, access the Baseline tab at a site level and click on the calendar icon. The top panel shows how the organization is performing against the baseline in regards to consumption (kBtu/SF/year), dollars spent ($/SF/year) and carbon emissions (lbs/SF/year). In the example, the city is currently using 2.39% less energy and producing 4.59% less CO2 equivalent emissions, but they are seeing an increase in costs by 9.10%. A stack rank of the site's current energy consumption as compared to the weather normalized Baseline is displayed in the bottom panel with the poorer performers on top. In the example, the first site is currently using 8.13% more energy than the Baseline while the fourth site is using 5.37% less energy. To calculate the baseline, B3 Benchmarking takes the sites’ consumption during the baseline year and weather normalizes it to other years for comparison to actual consumption. For example, if the baseline year is 2008 and you are viewing 2010 data, B3 Benchmarking will display actual 2010 consumption as solid bars, and the 2008 consumption normalized to 2010 weather as a dashed line. 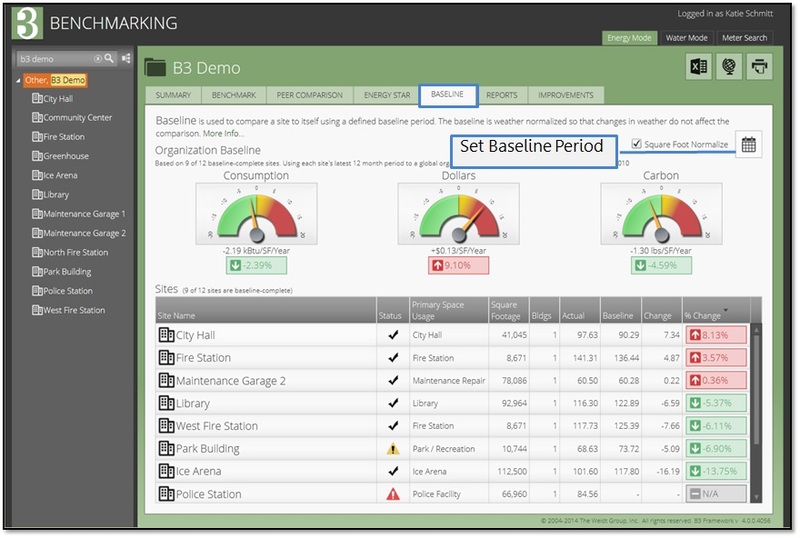 Because B3 Benchmarking has removed weather as a variable, you are able to see the change in energy performance due to non-weather factors such as occupancy, operation, or changes to the building systems or components. 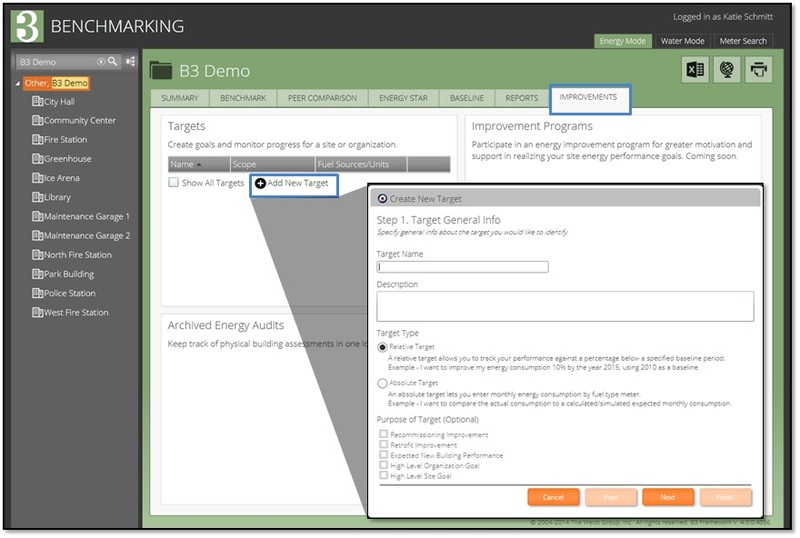 The Improvements view allows you to set targets, both relative and absolute, for organizations and sites. Once set, you can monitor your targets against actual consumption on the Reports tab. Create targets by selecting "Add New Target" and following the prompts. An example of a relative target is, '20% electric savings from a baseline year 2010 by the year 2015,' whereas an absolute target involves you entering predicted energy consumption provided by engineering models for specific or all energy sources. The Visualizations view allows you to visualize the energy performance of an organization or a specific site for multiple time frames for all fuel sources, in dollars, carbon dioxide emissions, native units, or kBtus. The default report is the Total Energy Dashboard; however, you may create various other reports to compare current, Baseline and Target consumption metrics. This example report displays actual kBtu/SF for both electricity and natural gas as blue and red bars as compared to the weather normalized Baseline as the dashed line. Looking at the dotted Baseline from January 2010 to December 2010, we can see that the organization used slightly less energy for most months in 2013. 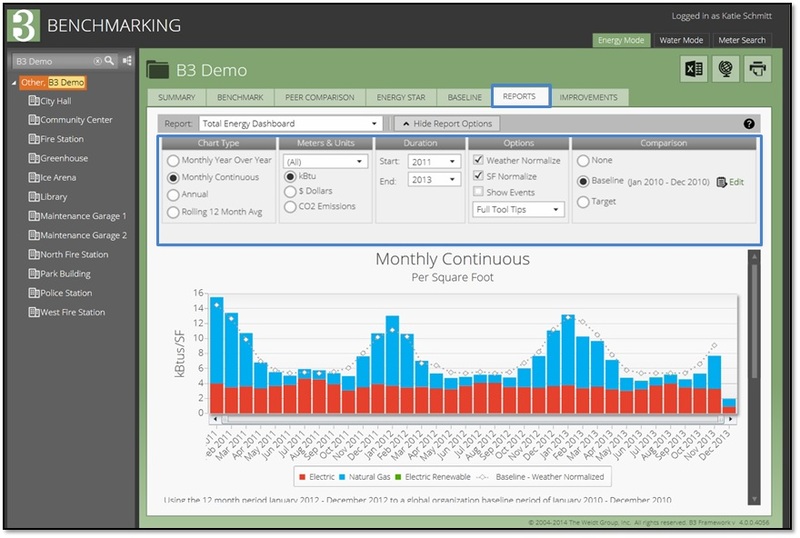 With monthly utility billing information and some basic facility data, the B3 Benchmarking system allows you to manage your existing buildings' water consumption. The system reports help you easily identify which of your building sites are consuming more or less water than in a previous Baseline period. By knowing how sites are consuming water, you will more easily be able to identify which buildings need the most attention for reducing water consumption. In the Water Mode, you can not only track potable water meters but also sanitary sewer and storm water meters. Just as in the Energy Mode, the tool is broken into two levels: the Organization and Site level. You can view water consumption at the Organization or Site level. Missing data for the organization is summarized in the top left corner. Looking at the example, this organization has 1 site, 2 building and 3 meter that are complete. Incomplete sites will be designated with a red warning triangle in the status column of the lower panel. This bottom section also summarizes the contiguousness and recentness of the meter data. In the Baseline view, you can stack rank your portfolio of sites to show which buildings are currently using more or less water compared to a previous baseline year. The baselines are used primarily to track savings from improvement projects and manage a site’s water performance in an on-going basis. To calculate the baseline, B3 Benchmarking takes the sites’ consumption during the baseline year and compares that to actual consumption for the current period. You are able to see the change in water performance due to factors such as occupancy, operation, or changes to the building systems or components. This example has a baseline year of August 2011 – July 2012. When you click the calendar icon and select a new 12-month period, you have established the “Baseline” performance for each site within the organization. The top panel shows how the organization is performing against the Baseline in regard to Consumption (kGal/SF/year) and Dollars ($/SF/year). In the example, the city is currently using 5.49% less water and are seeing higher water costs by 3.85% compared to their Baseline. Looking at the bottom panel, a stack rank of the sites' current water consumption as compared to the baseline is displayed with the poorer performers on top. In the example, the first site is currently using 5.49% more water than the Baseline while the second site has an error, which can be identified by hovering your cursor over the red triangle. The Visualizations view allows you to visualize the water performance of an organization, or a specific site, from one year to the next for all water sources in dollars or kGal (thousand gallons). The default report is the Water Monthly Continuous (kGal); however, there are various other reports and options to compare current and Baseline consumption metrics. Annual statistics are provided in the table below the graph. 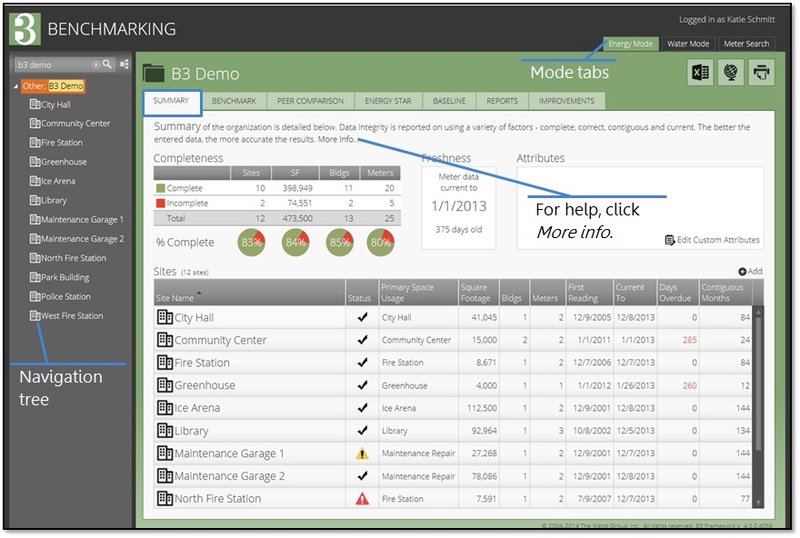 To enter a site or building, access the Organization or Site Summary tab and click the "Add" link on the middle right side of the screen above the building section. Follow the prompts and then complete the required General and Space Type tabs in the Building Editor. Edit a site by clicking the Notepad icon at the top right of the page. 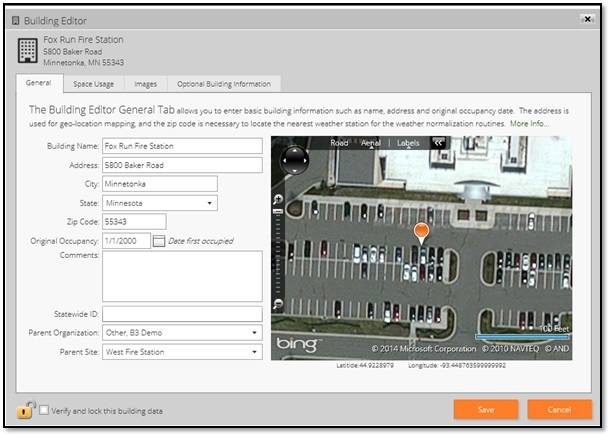 Edit a building by clicking on a building name on a Site level. To enter a new meter, access the appropriate Site Summary tab and click the "Add" link on the lower right side of the page above the meter section. A box will appear asking you what type of energy or water meter you would like to enter. 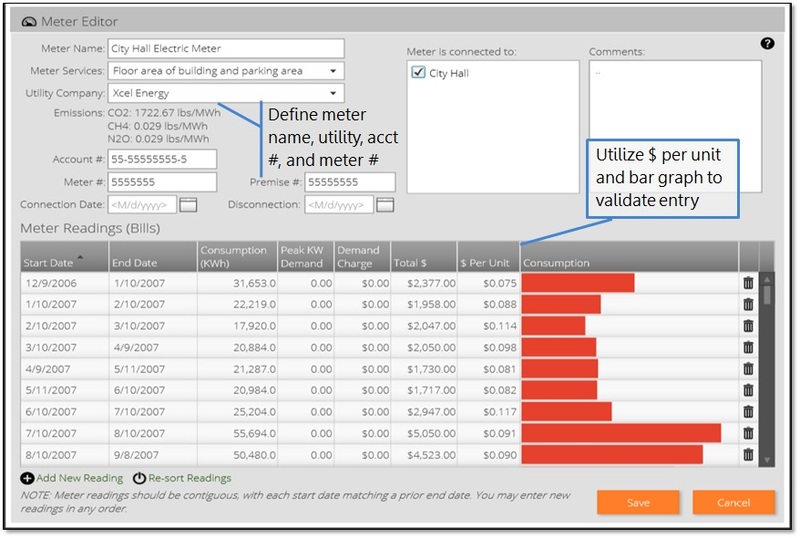 Upon choosing an energy or water type, you'll be taken to the Meter Editor, in which you will define the meter in the top left of the screen with a meter name, account number, etc., and then fill in meter readings in the bottom table.